This book is about an important cultural-political phenomenon: ethno-national diasporas. While these groups try to "feel at home" in their host countries, they maintain at the same time close contact with their homelands to promote their culture and interests. The book analyzes their continuous struggle to maintain their identity, organize, and fight against all wishing to prevent permanent settlement and integration in the host countries. It discusses the complex questions of the groups' loyalties to their homelands and host countries as well as their contributions to them. Preface and acknowledgements; Introduction; 1. Primary questions and hypotheses; 2. Diasporism and diasporas in history; 3. A collective portrait of contemporary diasporas; 4. Diasporas in numbers; 5. The making, development, and unmaking of diasporas; 6. Stateless and state-linked diasporas; 7. Trans-state networks and politics; 8. Diasporas, the nation-state and regional integration; 9. Loyalty; 10. 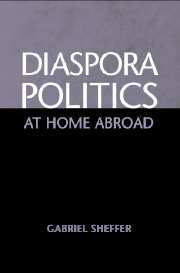 Diasporas at home abroad; References; Index.